June is Fireworks Safety Month. Flushing Hospital Wants You To Be Safe This July 4th. June is Fireworks Safety Month and with July 4th holiday approaching, Flushing Hospital Medical Center wants everyone to know the potential dangers associated with these explosives that we so closely associate with Independence Day. 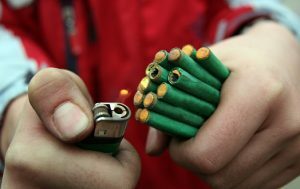 Fireworks are ILLEGAL in New York State, and are extremely dangerous when they are not being used by a professional. They burn at extremely high temperatures and can rapidly burn through clothing and skin. Items such as sparklers are mistakenly thought to be safe, but they are actually quite dangerous. This year, have a safe Fourth of July and leave the firework displays to the trained professionals. If you have questions about fireworks displays and safety, you can visit The National Council on Firework Safety webpage at http://www.fireworksafety.org. Take the test and learn just how much you know about fireworks safety. This entry was posted in Health by Michael Hinck. Bookmark the permalink.